We do not know when David wrote Psalm 23. Perhaps it was when his son Absalom tried to become king and David ran away. He went down to the Jordan River, crossing it by the ford called Jabbok. David then went on into a land called Gilead. There he met Brazillai, the shepherd. This experience made David think that God, too, was like a shepherd. God was just like Brazillai, a good friend to David. Barzillai gave David food and shelter. Additionally, Brazillai offered David good advice at a time in his life that he needed it. The popularity of this psalm is great. Many people gain comfort from Psalm 23 because later in the New Testament, we find that Jesus says He is the shepherd in the psalm. The shepherd leads the sheep to all that we need: food, rest and water. It is through our faith in Jesus, the shepherd, that we become His sheep and join His flock. Christ leads us to all we need too. Where to you “run to” when things seem out of control and piling on? How would you describe a friend? Why is it helpful to you to spend time with a good friend when things are troubling you? What is the purpose of the shepherd’s staff? the rod and the hook? How does it relate to us today? Are there things in our society today that are taking away from the skills of friendship? What about the “life experiences” of a shepherd prepare them to be a good friend? 1 Now the tax collectors and sinners were all gathering around to hear Jesus. 2 But the Pharisees and the teachers of the law muttered, “This man welcomes sinners and eats with them.” 3 Then Jesus told them this parable: 4 “Suppose one of you has a hundred sheep and loses one of them. Doesn’t he leave the ninety-nine in the open country and go after the lost sheep until he finds it? 5 And when he finds it, he joyfully puts it on his shoulders 6 and goes home. Then he calls his friends and neighbors together and says, ‘Rejoice with me; I have found my lost sheep.’ 7 I tell you that in the same way there will be more rejoicing in heaven over one sinner who repents than over ninety-nine righteous persons who do not need to repent. A Pharisee was forbidden to be the guest of any such man or to have him as his guest. He was even forbidden, so far as it was possible, to have any business dealings with him. It was the deliberate Pharisaic aim to avoid every contact with the people who did not observe the petty details of the law. Obviously, the Pharisees were shocked to the core at the way in which Jesus spent time with people who were not only outsiders, but sinners. In the minds of the religious leaders of Israel, this contact defiled Him. We will understand this parable more fully if we remember that the strict Jews did not say “There will be joy in heaven over one sinner who repents,” but, “There will be joy in heaven over one sinner who is obliterated before God.” They looked sadistically forward not to the saving but to the destruction of the sinner. So Jesus told them the parable of the lost sheep and the shepherd’s joy. The shepherd in Judaea had a hard and dangerous task. Pasture was scarce. The narrow central plateau was only a few miles wide, and then it plunged down to the wild cliffs and the terrible devastation of the desert. There were no restraining walls and the sheep would wander. The shepherd was personally responsible for the sheep. If a sheep was lost the shepherd must at least bring home the fleece to show how it had died. These shepherds were experts at tracking and could follow the straying sheep’s footprints for miles across the hills. Every shepherd would to risk his life for his sheep. Many of the flocks were communal flocks, belonging, not to individuals, but to villages. There would be two or three shepherds in charge. Those whose flocks were safe would arrive home on time and bring news that one shepherd was still out on the mountain side searching for a sheep which was lost. The whole village would be on the watch, and when, in the distance, when they saw the shepherd striding home with the lost sheep across his shoulders, there would rise from the whole community a shout of joy and of thanksgiving. Jesus is telling us that God is like this too. God is as glad when a lost sinner is found as a shepherd is when a strayed sheep is brought home. God knows the joy of finding things that have gone lost. Our society today seems to have flipped this, finding joy in the sinning and hatred with the saved. Thank goodness it is a thousand times easier to come back to God than it is to come home to a world filled with criticism. Why is it comforting to think of Jesus as a shepherd? What are the responsibilities of a shepherd? How might the role of a shepherd be different than say a cowboys on a cattle ranch? How do you feel about the fact that Jesus seems to care more for the one who is lost than the ninety nine who are not lost? What do you think this story says about the other ninety nine? What makes Jesus a good friend? 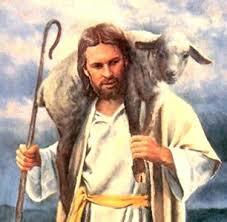 There can be no greater feeling in life than to be saved, carried on the shoulders of the shepherd. How do we keep this moment of gratitude and happiness alive in our lives?